Figures tools. This category is dedicated to drawing tools - hand and elektroinstument, metal, wood and plastic, krupogaboritny and small. The tool is very interesting to draw its many details and interesting shapes. As always, try to use all the materials for painting - watercolor, pastel, charcoal, acrylic, gouache, colored pencils, and a different degree of study of the figure. How to draw a pencil stages ax? 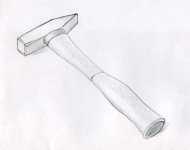 How to draw a pencil hammer in stages? Как нарисовать лопату карандашом поэтапно?